He's All Right When You Know Him. Sung with great success by Tony Pastor. 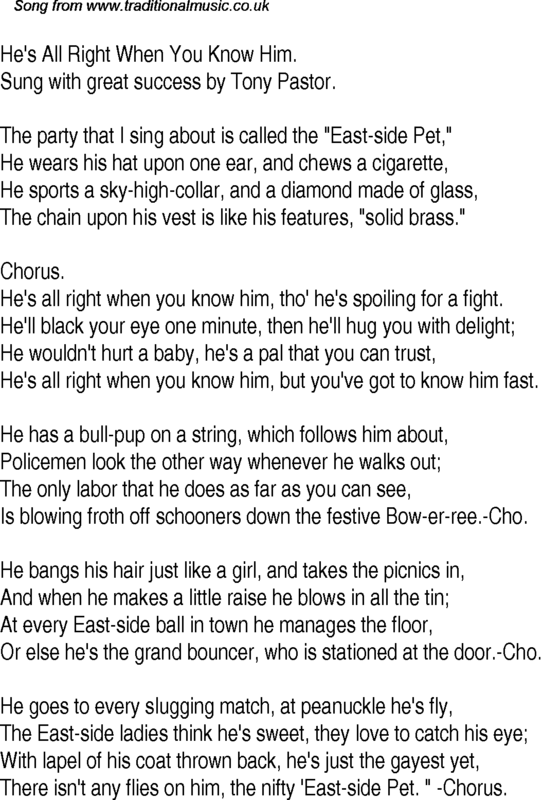 The party that I sing about is called the "East-side Pet,"
The chain upon his vest is like his features, "solid brass." He's all right when you know him, tho' he's spoiling for a fight. He's all right when you know him, but you've got to know him fast. Is blowing froth off schooners down the festive Bow-er-ree.-Cho. Or else he's the grand bouncer, who is stationed at the door.-Cho. There isn't any flies on him, the nifty 'East-side Pet. " -Chorus.